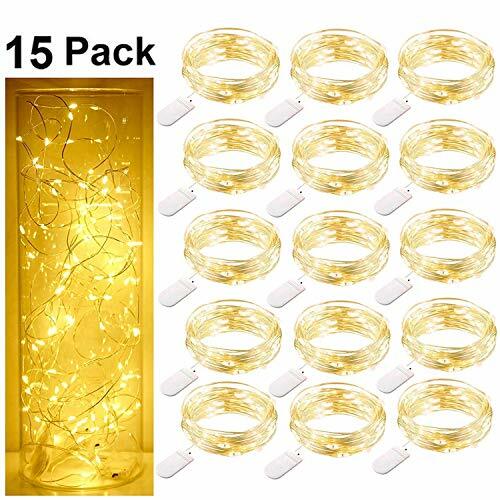 The SmilingStore LED Starry copper wire String Lights composed of Super Bright Warm White Color Micro LED that won't overheat while giving a light fairy effect. After hours of use, they are also completely safe to touch without any risk of burns. The LED Starry Lights are safe for children over three years and pets. It's the perfect decoration for girls and teenagers rooms. The ambience that they emit is relaxing. Starry Lights apt for Square, Garden,Shop,Restaurant, indoor and outdoor settings. These hanging led wire lights are suitable for wedding decorations. As Left Product Image shows -You can put the string into Water or Non-Corrosive Liquids.It's a Waterproof String(Except the battery pack). - The Best After-sale Service: 12-Month Warranty Service and 1-Month Return Policy. - Please tell us if you meet any problem during or after purchasing of SmilingStore Products, we will respond as soon as possible within 24 hours. - We Seller Pays for Return if Item is DOA or not as Described. - Fulfilled by Amazon with Fast Shipping. 【Safe High-quality Fairy String Lights】: All Super Bright Lights are Safe to Touch. High Quality Low Power & Heat Insulated Copper Wire will not make it Overheat during usage. Just Simply Switch on the Lights and Enjoy these Amazing Glaring Fairy Lights. 【Flexible&Waterproof Copper Wire】: 7.2feet/2.2m Extra Thin String with 20 LED Starry Lights(Color Temperature 2700-2900K, Warm White). Flexible Thin but Sturdily built, the string lights can be Easily Bend, 360 degrees Sparkle with Romantic Effect. You can put the string into Water or Non-Corrosive Liquids.It's a Waterproof String(Except the battery pack). 【Enjoy DIY Fun& for Many Occasion】: Made of Ultra Thin Copper Wire and this Battery Powered String Lights can be Easily Designed to any DIY Shape You Like.Suitable for Party, Wedding, Barbecue, Halloween, Christmas Indoor and Outdoor lighting decoration,etc. It is a Good Gift for your Friends and Families. 【Easily Powered by Batteries】: 2 x CR2032 included,battery box with on/off switch easy to be replaced. Easy to operate and Small enough to hide. 48 hours continuous battery life and longer if using with breaks. Batteries need to be replaced when the lights get dim. 【Pack of 15 & Brand Guarantee】: What you get - Pack of 15 units of SmilingStore LED starry string lights. A very Good Deal of 15pcs to order. LED lights can last 50,000hours under regular using, with 12 months Quality Warranty. If you have any questions about this product by SmilingStore, contact us by completing and submitting the form below. If you are looking for a specif part number, please include it with your message.